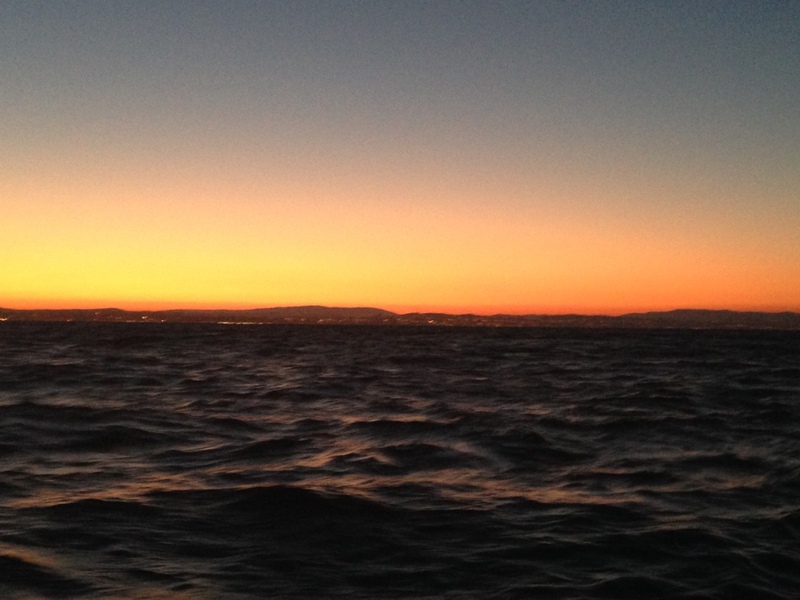 On Wednesday 14th October, everything still looked good weather-wise and we got underway towards Nazaré! Heading out… Sorry, no sunrise photo this time!! The wind was mixed – not much of it, but from all kinds of directions for the first few hours, along with a bit of a choppy sea, but it soon settled down into quite a pleasant journey. However, we saw on the NavTex (a live nautical text messaging system that gives updates on weather, incidents etc) that there was an alert out for a single sailor in a dinghy (who had had to abandon his sinking trimaran) in the southern part of the Bay of Biscay. The weather forecast hadn’t been great for there, so we could only wonder what had gone wrong with his liferaft and hope he was found safe and sound in his dinghy. Pretty scary stuff. Just before nightfall, we approached the Portuguese border, so we lowered our Spanish courtesy flag and raised our Portuguese one. An exciting moment for me in particular, as I have never been to Portugal, so Jamie is the tour guide for this part of the trip! Bella was also excited by this new country – in fact so excited that she weed all over the off-watch berth and duvet. Not cool. Guess who spent the rest of the trip outside in the cockpit instead of cuddled up on the off-watch berth?! We drew up seawater to rinse everything off and deployed a sleeping bag for the rest of the trip. 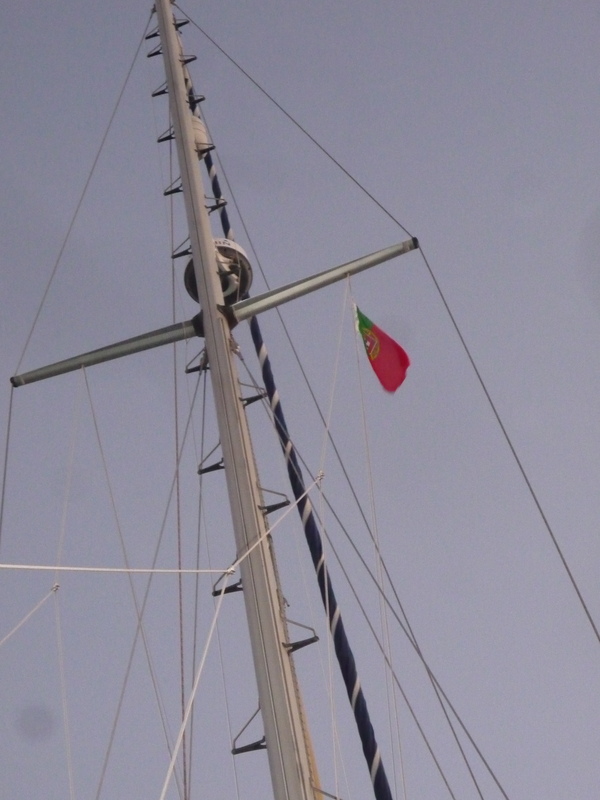 The Portuguese courtesy flag is up – uncontrollable excitement for one member of the crew! We had used most of our fuel on the way down from La Coruña to Muros, so we decided to make a quick fuel stop in Porto – turning right into a beautiful sunrise. The entrance to the estuary and marina was pretty nasty – these are the times that make Jamie nervous, whereas I’m more of a ‘near land’ sort of person so I dealt with the pilotage while Jamie overcame his apprehensions at the helm! It was choppy, and into a headwind with a surprisingly high level of swell for just 18kts of wind (the RCC Pilot Guide advises against trying to enter during strong winds and heavy swell/conditions or at night, and we saw why!! ), there were also lots of fishing boats at anchor with fishermen fishing off the sides (unlit, hence a nighttime entry not advisable!). The engine really had to work hard to get us in there and we crept in at 2kts with a disproportionate number of revs! However, the marina staff were incredibly friendly and efficient. They sent a rib out to meet us – this is a standard service (you just radio ahead), but is advised at low tide especially – we hit at almost exactly low tide, and we draw 1.7m, so we thought it was worth the effort of a quick radio call! We had a good chat with the guy on the fuel pontoon, and we wished we had been able to stay longer – it is definitely on our list for the summer though! The fuel was also noticeably cheaper than La Coruña, which had been a bit of a shock after buying at ‘non-propulsion’ (i.e. tax free) prices (well, we *do* have a diesel heater….) in the UK…. We got a quick update on the next 24-hour’s weather and nothing had changed – in fact, the wind had dropped even further, so the refuel was a good decision! 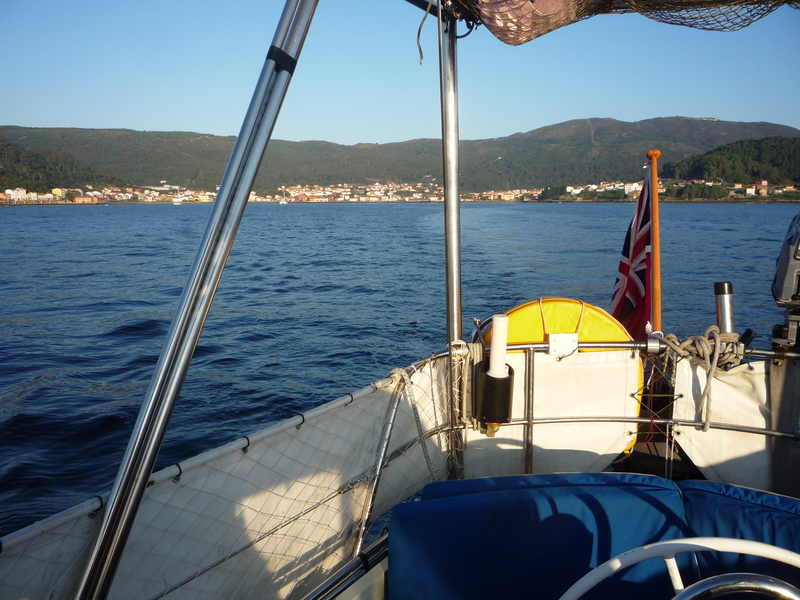 We headed out of the estuary at 7.5kts and running with the swell and chop – much nicer all round! Within 2 hours the wind had indeed dropped as we turned south again. To 2kts. On our nose… The sea calmed as well, and within 12 hours or so, we were motoring along as if we were enveloped by slightly rolling dark silk. It was actually a bit eerie overnight, and it was hard to judge the distance and direction of other vessels. The AIS (that shows other AIS vessels) was a real boon, but of course not every other vessel is on AIS, so it doesn’t negate having a good look round! Several times it would have helped if lobster pots had AIS, as they crept up on us unawares, and on a couple of occasions, we didn’t even see them until we were passing them 2m away! As we progressed south, the air took on a wonderful ‘warm place’ kind of smell – like stepping off an aircraft in South America; I became quite obsessed with sniffing it. Jamie thought I was nuts. We had been going so fast (!) that we realised we would arrive in Nazaré before dawn (we prefer to arrive places in daylight if possible and safe), so we throttled back a bit and arrived just as the sun was rising (we do love a good sunrise approach!). We moored up, and I walked across a small patch of desolate scrubland (I make similarities to arrivals at a remote South American airfield) to reach the marina office. The guy at the marina dispels all doubts we may have had by being extremely friendly and helpful, although this is clearly not a top-class facility! The showers are mediocre, and the washing machine had broken and been removed – which was not good for our puppy-soiled duvet! A trip to the town’s launderette was in our future! We needed to move berth as apparently the pontoon we had moored to ‘wasn’t safe’ (more on this – and the title of this piece – later! ), so we headed over to our new berth for the next few days and deployed plenty of fenders, as the forecast was for a bit of wind. 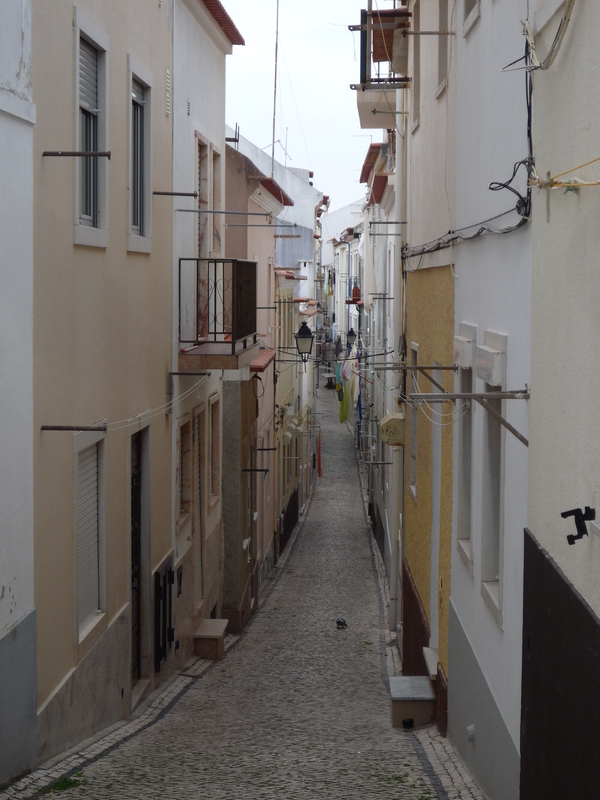 We walked into town along the beach in the afternoon, my first experience of Portugal, and into town. The next beach along, just north of the town centre (Praia do Norte) is where the world record for the biggest ever wave surfed was set in 2011 by Garrett McNamara (http://www.youtube.com/watch?v=58a9xYOweU8). It’s a really picturesque town with lots of little alleyways, and people chatting and hanging their washing out! It doesn’t feel like a big town at all really, but it does have its own patch of the typical tourist tat shops along the sea front alongside some inviting looking seafood restaurants. There was also a ‘museum’ of old local boats – including wartime lifeboats – on the beach, and further along several women selling dried fish – dried in large racks behind them. 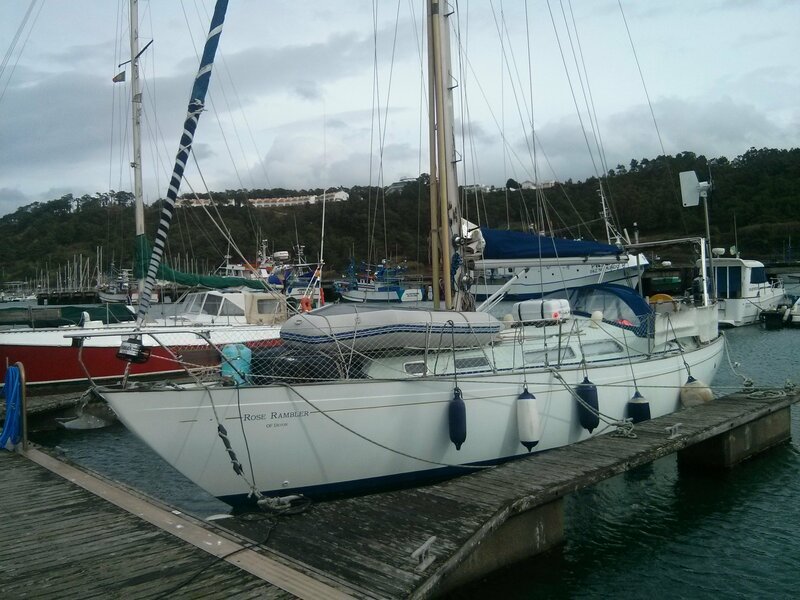 We will be staying here for 4 or 5 nights to avoid some bad weather out at sea, so plenty of time to explore some more! Speaking of bad weather, I am typing this on Saturday afternoon (17th October). We have both just got back in the cabin, soaking wet, windswept and muttering ‘bloody hell’ (and worse)…. You remember the forecast ‘for a bit of wind’? Well, yes, it came through a couple of hours ago. Quite a lot more than a bit. It had been picking up all morning, but around mid-day we felt a bang on the hull. A similar bang to about a year ago when one of our fairleads snapped off during a storm in Brighton (fairleads are metal ‘guides’ that are drilled, tapped, screwed, and resined on to the boat to guide the mooring lines from the cleat on the boat to the cleat on the pontoon – they take a huge amount of load, and they protect both the boat and the mooring lines from damage. Basically, they’re pretty strong, and pretty important!). So we go outside to find that we just need to tighten our mooring lines – which is easier said than done when you are trying to push an 11 tonne boat against a strong wind. Jamie pushes the bow while I sweat the rest of the line and cleat it off. We work in small bursts between the gusts of wind. All sorted. Tying in a bit tighter seems to have done the trick. Or so we think. We retire downstairs and have a biscuit. We read on the Navtex about a Swedish boat underway from Sweden to Greece – Search and Rescue are out looking for them now. Again, all we can do is hope that they’re ok.
We switch on the instruments out of curiosity to see what sort of windspeed we’re getting – it’s already mid-30’s which is Force 8 (gale force) – and we’re in a marina that offers good shelter! We look at each other, eyebrows raised, a bit shocked. Then it happens again. We’re outside a bit quicker this time. 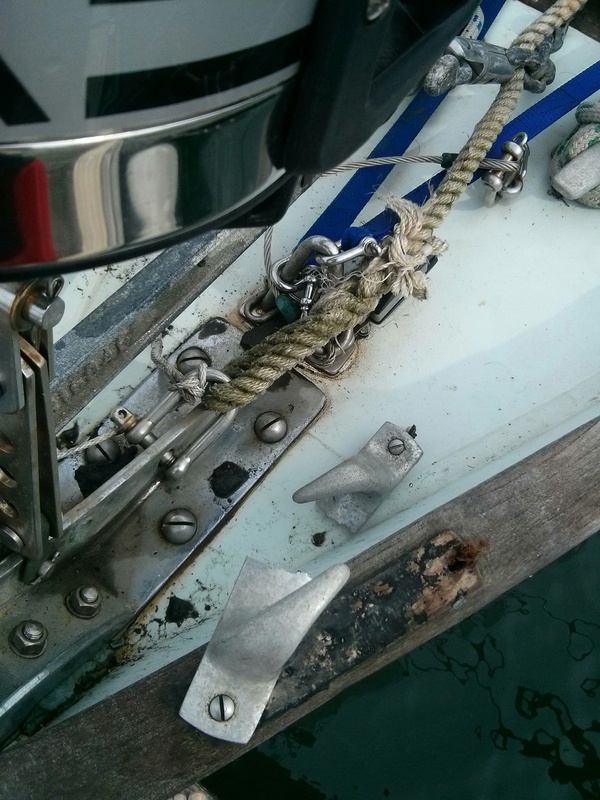 The boat is already being blown far off the pontoon so something isn’t right, and the pontoon is wet and slippery, just to add an extra bit of danger to our hurried disembarkation… We discover that the it is indeed a fairlead problem again. Not exactly snapped off this time, but completely snapped in half. And then snapped off. Dios Mio, as the locals say (or something a bit stronger perhaps). We re-deploy mooring lines, deploy extra mooring lines, deploy stronger mooring lines. A chap from down the pontoon (another Brit on a Boat) comes to help us as he has been doing the same to their boat. He suggests some good alternative tying-on techniques, and provides a bit of extra muscle, both of which we are grateful for. 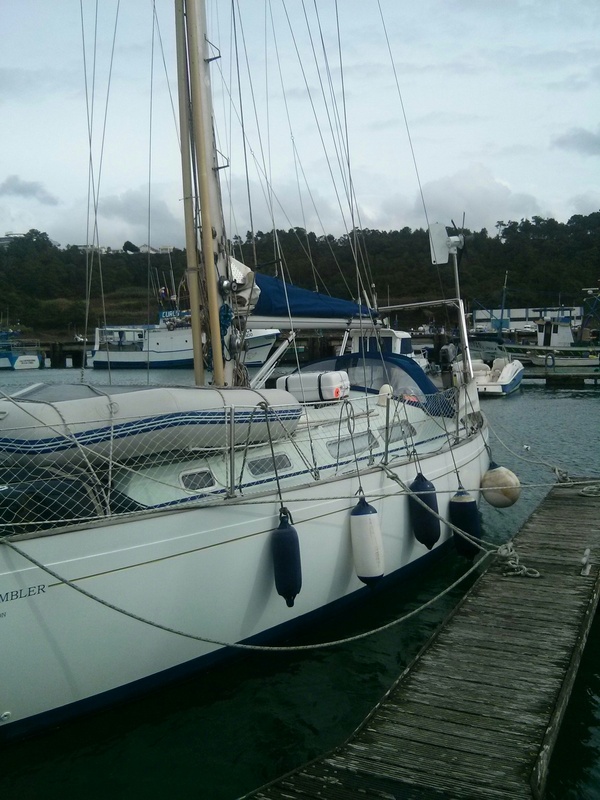 We did have 4 mooring lines – sufficient under normal conditions – now we have 8. Even cleating on to the pontoons is difficult as keeping your balance in the wind is difficult! A little gathering of sailors happens around our boat when everyone is tied in. A German lady, us three Brits, and a Norwegian lad. We discuss strong winds, and the Swedish boat underway. While we wouldn’t wish it on anyone, it *is* forecast weather and seems a bit nuts to all of us. That said, they will probably be safer out there, no matter how scary, than trying to attempt to come anywhere near land. It scares me just thinking about it. Mooring lines and fenders? Yup. We’re sorted for those! The wind hits 44kts – the strongest we think we have ever experienced – Strong Gale Force 9… Blimey! All the 4 boats are now tied in as safely as they can be, and the German lady tells us the winds are due to drop off after lunch. 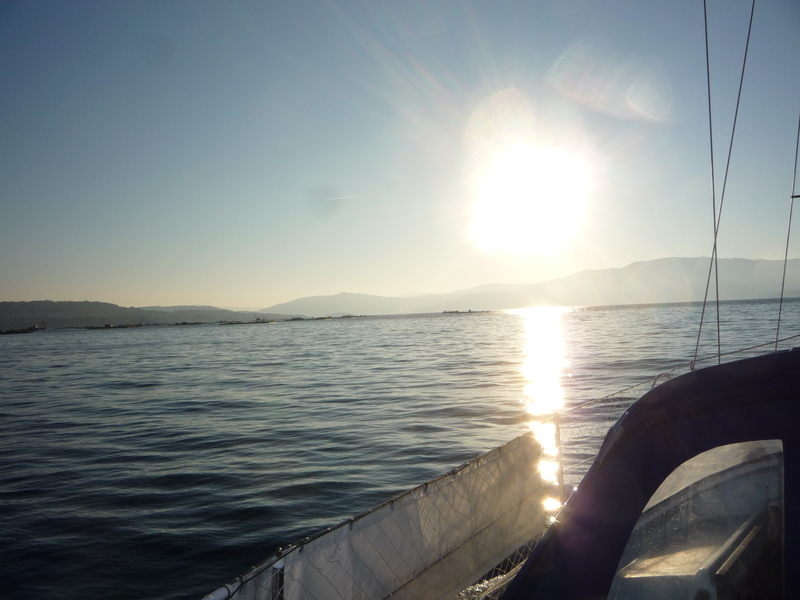 We do hope so… Nevertheless, we decided to have a boat-based day today…! In weather like this, we prefer to be with the boat so that at least we can do something. 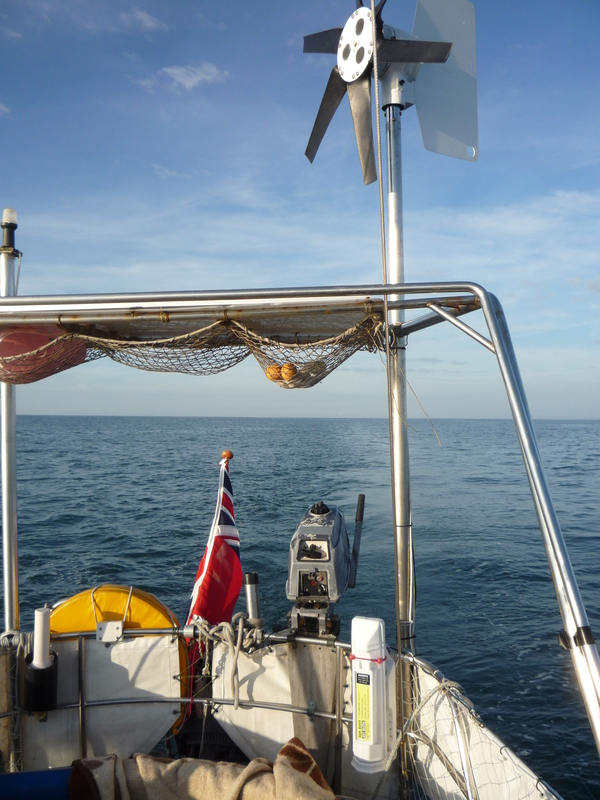 A bit flies off our wind turbine too…It is spinning so fast and the boat is pitching something chronic, even on the mooring, we decide it is safer to leave it alone rather than trying to fix it or tie it off. We cross our fingers it does not develop some form of vertical lift and fly off on it’s own, or the blades come flying off like film special effects… We also discover that the ‘unsafe’ pontoon we had originally moored to had actually broken off (with 4 boats on it) a few weeks previous! A diver had been sent down to re-weld the connections and chains on the two other pontoons (one of which we are now moored on), but had not had time to do the third yet…! He should manage to do it on Monday…! There are a couple of small boats… as well as a 42′ Westerley still moored on the ‘unsafe’ one, so we hope they don’t suddenly get any closer to us over the next day or two….! There are a few boats here (including the Westerley) that have been left while their owners travel inland (or whatever) – we’d be reluctant to leave RR to the elements – especially when they were fairly well forecast! We check the instruments on getting back below – at one point we were apparently doing 0.5kts tied in on our berth, just from the movement!! Now (at 17:00) things have died down a bit; we are still getting regular gusts, but they are ‘only’ up to 30kts – altogether much less scary! Previous Post11. The Coast of Death and Beyond!